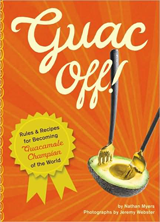 Turbula - Culture - Book review: "Guac Off!" To learn more about this book, Turbula recommends viewing its Amazon.com entry. One can't live in Southern California (where Turbula Nation is based) without a strong familiarity with the avocado. Other parts of the country may be ignorant of the pear-shaped fruit with the thick green skin (in parts of the South, they refer to it as an "alligator pear"), but the avocado is iconic in SoCal and northern Mexico. A new book by a pair of former Fallbrook residents (the book is even dedicated "For Fallbrook") is pitched as a guacamole recipe book  but it's really more an homage to the fruit and the dip we make from it. And at times, the breathless tone of wonder and over-the-top hyperbole will induce some serious cringing. But there's so much good info in here, Jeremiah Webster's photographs are so gorgeous and author Nathan Myers has collected such a strong set of guac recipes that any faults are minor when viewed against the whole. It's a small book  7.25" x 5.25"  which is just the right size for displaying the mostly simple guacamole recipes one to a page, with a full-page color photo opposite. Ranging from your basic guacamole  avocado, lime juice, salt  to more exotic creations like "Feta and Shrimp Cocktail Guac" or artichoke guac, there are a couple dozen recipes in here, not a one of which doesn't sound perfect for dipping corn chips in. And yet none of them are particularly difficult  there's no simmering or reductions or anything remotely complicated. What is a bit confusing is that several of the recipes are labeled "Winner: 2003"  but winner of what? The authors' informal "guac-offs"? The official Fallbrook Avocado Festival? It would be fun to know which contests these recipes won. But that's not critical information. What's critical is how easy it is to make the poblano chile guacomole, and how utterly decadent it sounds for next Sunday's football watching party.